Sky Sports for iPad upgrades Champions League and Ryder Cup experience | What Hi-Fi? The Sky Sports for iPad app has been upgraded to offer an improved multimedia experience for Champions League football and Ryder Cup golf. The new look app will allow users watch multiple games in the Champions League using split-screen technology or multiple live streams of the forthcoming 2012 Ryder Cup. As well as multiple streams of live content, the enhanced Sky Sports for iPad app will incorporate live scores and live tweets for both events. The upgrade follows the launch of split-screen viewing on Sky Sports for iPad for Sky's F1 coverage. David Gibbs, director of Sky Sports Digital Media, commented: "We hope that the launch of the UEFA Champions League Event Centre on iPad will help fans enjoy the very best of our coverage with the ability to match-hop on their second screen without interrupting their main TV viewing. "This update to the app follows the successful launch of the online Event Centre on www.skysports.com last season as well as the F1 and Barclays Premier League second screen offerings on the iPad earlier this year and we have seen a real appetite from fans to follow live sport on other devices in this way, at the same time as watching on their main screen." Located within Sky Sports for iPad, the updated Second Screen experience is accessible at no extra cost to all Sky customers who take Sky Sports 1 and Sky Sports 2. 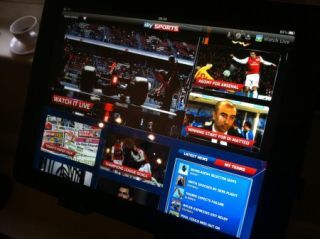 Sky Sports for iPad is available for free from the App Store on iPad or from iTunes. The Sky Sports for iPad App is also available to non-Sky customers on a standalone basis for £4.99 per month through In-App Purchase (excludes access to Sky Sports 1-4 and Sky Sports F1).